We've all been there - a tropical getaway is coming up and it has been a while since our skin has been exposed to that much sunlight (and we refuse to look like a lobster on day 2 of our vacation). So, we start preparing our skin for heavy sun exposure with...more sun exposure. Sounds silly when we say it out loud doesn't it? That's because base tanning in the sun or worse, in a tanning bed, is really just exposing our skin to twice the amount of skin cancer causing UV rays. Protecting ourselves from skin cancer by tanning is like preventing lung cancer by smoking. You aren't fooling the sun! Sunburns come in all kinds of colors, not just red. Your skin's production of pigment (regardless of the color) from UV damage is simply an attempt to protect itself. So, that bronzed tan you had been working on all summer long could have been just as harmful as a stereotypical blistery, pink one. The more sun exposure, the more skin damage. 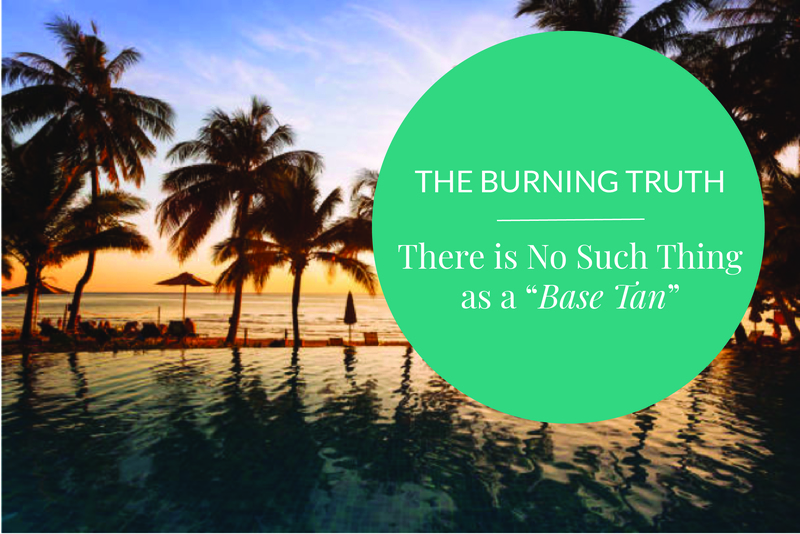 A base sun tan is only equal to about 2 SPF and one from a tanning bed is equal to even less, so it's doing more harm than good. When you have a nice tan going and your skin ins't giving you any visible signs of sun damage, it is also easy to forget about applying and reapplying sunscreen which can then lead to even more harmful sun exposure. We encourage you to ditch the base tanning all together and make this fall an excuse to explore healthy alternatives to baking in the sun. Click here to learn more!